We waited, all eyes fixed on the horizon, everyone saying the same word over and over: Rain! Rain! Rain! But none came. After a while, people started drifting away and the only sound left was their angry mutterings and disappointed sighs. I turned my back on the horizon as well. Like everyone else, I stared at the ground as I walked. No one wanted to look anyone else in the eye. 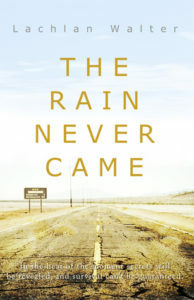 Lachlan Walter is a writer and critic whose debut novel The Rain Never Came has recently been released. He will be in discussion with Jeremy Stanford about science fiction and fantasy writing on Saturday August 25 at 12.45pm. Don’t miss out on this session, book tickets here.